All of us have grown up listening to fairy tales and as we grow up and advance in age we realize that these fairy tale characters and stories belong to a beautiful imaginary world where every story ends happily and the good always overshadows the evil. Yet for all of us it would like to relive our childhood memories or would like our children to have all their imaginary characters come true, there is Disney World which is often referred to as the happiest place on earth. 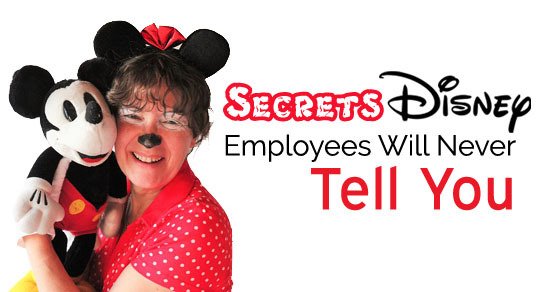 Yet, here is a list of the things which Disney Employees are never going to reveal to you simply because revealing disney secrets will get them fired! In the course of our lives, we will come across employees in even the biggest of companies who might tell us that they do not know something when faced with a tough or even a challenging question. At such times we do end up feeling a little letdown. Being turned down like this seriously affects our sense of curiosity and interest. It is a well-known fact that this sense of enquiry is most noticeable in little children who are highly imaginative and curious about the world they live in. Disney encourages children to keep asking questions by ensuring that no matter what, employees never utter the words Í don’t know’ and always give an answer to the best of their ability. As long as you are on the premises you cannot even think of stepping out of your character for a minute no matter how tired or low you might be feeling on a given day. This is one of the rules that a Disney employee will never reveal to you as he is expected to keep mum about all the rules and impositions which they are expected to adhere to at all points in time. Staying in character at all times is not an easy task. But yet employees are made to go through strict training such that they are used to playing their characters through the day, rather naturally and without trouble. As a cast member, you are expected to have a distinct body language. At no point of time are you allowed to forget all that you have been taught and trained to do and even the manner in which you point has to be in a distinct way. You are never allowed to point with merely one of your fingers, rather you are expected to make use of two of your fingers while doing so. Thinks like these might not even be noticeable to the people who come to visit this theme park, but these are some of the main rules which all employees have to be mindful of . It is not just by itself that the premises are immaculately tidy. All employees have to ensure that they do their little bit to keep Disney clean and if they notice some trash which has been thrown, they have to make it their individual responsibility to go and pick it up themselves. This same rule implies to all the employees, whether you are Jasmine, Cinderella, Snow White or even Ariel! However, those employees who have the job of picking up the trash and managing the bins have been trained to even pick up the trash in a distinct manner. Disney does its best to ensure that aspire for perfection at all points in time. At Disney, they know exactly what they are looking for when they are casting for a particular character and at no point in time are they going to settle for anything short of what they want and need. When casting for a character, they carefully measure the person’s vital statistics and even ensure that the characters height is absolutely perfect such that they look the part which they are going to play. Even slight discrepancies are not entertained. Walt Disney was an individual who did not like to be called by any other name except his very own first name. He did not care for nicknames, because he thought that if a person had a name then why should you go ahead and call them by something else, rather than what they ought to be called. So a person’s name tag has nothing but his or her first name, not the designation and not even his surname. However, if a situation arises where someone has the same name as you do then in that case you have the freedom to choose another name by which you would like to be known, as when people are referring to you. We do live in a technological age, having a job at Disney is bound to make you want to pull out your phone and take a few selfies while in character, yet this is something which employees cannot do under any circumstances. When it comes to hair regulations, things are kept rather strict. Men have to follow certain strict rules and women are allowed to maintain long hair provided the hair is neatly tended to and well kept. They cannot leave their hair open no matter what, it has to be tied in a neat pony or braided. Things like lice and dandruff will not be acceptable and having your hair coloured is not acceptable. When you are in character, your facial expressions are very important indeed. These characters are expected to be with a smile on their face throughout the day and are not expected to even disclose their personal identity to anyone. When you play a particular character for Disney it is important that you do not let anyone from the outside know which character it is which you are playing. If you are caught doing this and revealing this secret even if it is on your social media profile, you will immediately be shown the door without being given any second chance. Nowadays there are a lot of people who belong to the art and entertainment industry, who does tattoos and piercing on their body. Though these tattoos or body piercing have their own pros and cons, but when working for Disney its a big NO. Most professionals in the world at large are not allowed to have tattoos or piercings, simply because many think they look unprofessional and even a little unsightly. Similarly, if you work at Disney, then having tattoos or body piercings of any kind are not allowed at all. Women are only allowed to have a simple ear piercing without wearing any large or ostentatious jewellery. Many might think this is archaic but that is just how things are at Disney if you are not happy you are free to leave at any given time. If you are someone who has some problem with your eyesight and need some aids to help you along the way, Disney allows its employees to have glasses and spectacles, provided they are of a particular kind. So if you are an employee who thinks that you will not look good in the glasses which they say is permissible, then in such a case it is indeed advisable that you opt for contact lenses. Those individuals who are in character have to dawn lenses if the part which they are carrying out does not wear lenses. No rules can be bent at any point in time in this regard. Employees say that if you are someone with a strong rebellious streak then it is advisable you do not opt for working at Disney. Taking a trip to Disney World is a huge thing for not only any child but for also any adult. On a trip like this, the child is bound to eat a lot of junk food, drink a number of fizzy drinks and all these are going to build up inside him and possibly make a reappearance when he vomits all this out after going on one of the many enjoyable rides. Even under circumstances as these, the cast members cannot act with disdain or shout at the child. They are strictly given instructions that since the child has been brought here to have fun, it is unacceptable to frown upon whatever has happened inadvertently. It is their job to cheer up and tend to the child instead. Once you have been selected to play a distinct character after a tiresome and extensive screening and auditioning process, you have to be put through a lot of training so that the character becomes a part of you and you are able to bring that character alive by virtue of your stance, posture, words, tone of voice and even expressions. An employee will never reveal how he or she is made to go through extensive training so that even the autographs which they distribute to the children are in a perfect manner and cannot be written in any old manner. Disney knows that such autographed photos are kept with the visitors as a lifelong treasure. Like many offices across the globe which have specific rules about how much facial hair you ought to or ought not to have, in Disney too there are some strict rules which employees have to abide by such that they do not get into trouble of any kind. For the women, they cannot have shaved eyebrows at any cost. While for the men, it is advisable that they be clean shaven, yet if they do so desire to have a moustache or a beard then there are a number of things which they have to keep in mind. Given the hassle, it is better that they shave all their beards or moustaches off. Moustaches must be trimmed regularly though beard can be grown out. Most of these things might come as quite a rude shock to many people considering how most of us would think that working for Disney only means unlimited happiness and joy. While the job is very pleasurable, especially since they get to interact with so many people and even put a smile on so many individuals face, doing such a job is not very easy at all as remaining in character at all times is quite a challenge in itself. It is these employees who have to be trained extensively to give a favourable reaction to anything which happens around them while they are in character.